A special lecture on strategy to work for the UN will be held. Guidance session for applicants for the Graduate Program for Real-World Data Circulation Leaders in 2017 will be held on December 20th and January 16th. You are always welcomed. A seminar on science writing is held by Integrative Graduate Education and Research Program in Green Natural Sciences. Please see the link in Japanese for more details. A special lecture on management in hospital and health care system in Vietnam will be held. A Global Ideathon will be held as an event of the HeForShe movement. The theme is “How can we eradicate gender based violence from social activities on campus?” It will be a good opportunity for Leading Program students to discuss in English. Leadership Development Seminor entitled “Talents and attitudes required for Human Resource of Global Era” will be held. Special Lecture by the Astronaut “Relationship between People, Technology and Space” will be held. A joint symposium for the six Programs for Leading Graduate Schools will be organized. The theme of the symposium is “The Future of Graduate School Education in Nagoya University: Lessons Learned from the Program for Leading Graduate Schools”. We sincerely hope you will be able to join us. Please visit the Joint Symposium Website for more information. The registration site is open. Career Development Seminar entitled “Introduction to Science Journalism” will be held by PhD Professional: Gateway to Success in Frontier Asia program. Participation of all the leading program students in Nagoya University is welcomed. The Forum 2016, Program for Leading Graduate Schools will be held in Hilton Tokyo Odaiba. Leadership Development Seminor entitled “The Japanese Challenge for Promoting Biotechnology in 21st Century” will be held. Leadership Development Seminor entitled “Development and in-orbit performance of small sized spacecraft: From the viewpoint of ADCS (Attitude determination and control system)” will be held. Japan International Aerospace Exhibition 2016 (JA2016) is the best opportunity to access the latest activities and technologies in aerospace and defense and to meet with decision makers of companies and government policy makers. The final review of mission-proposal phase in the “ChubuSat Instrument Development Project” will be held. Please see this link for more details." The income-tax return seminar will be held by the Organization for the Promotion of Leading Graduate Schools. Scholarship recipients are recommended to attend this seminar, who have never been attending this seminar before. Call for applications to participate in the Universal Village 2016 Student’s Forum to be held on 7th October 2016. Leadership Development Seminor entitled “Short Overview of Edo Period Printed and Material Culture” will be held. Leadership Development Seminor entitled “Whole New Landing Systems of Lunar/Planetary Exploration Spacecraft” will be held. Call for applications for the 9th HOPE Meeting with Nobel Laureates organized by JSPS is open. Please visit this link for the detailed information and application. 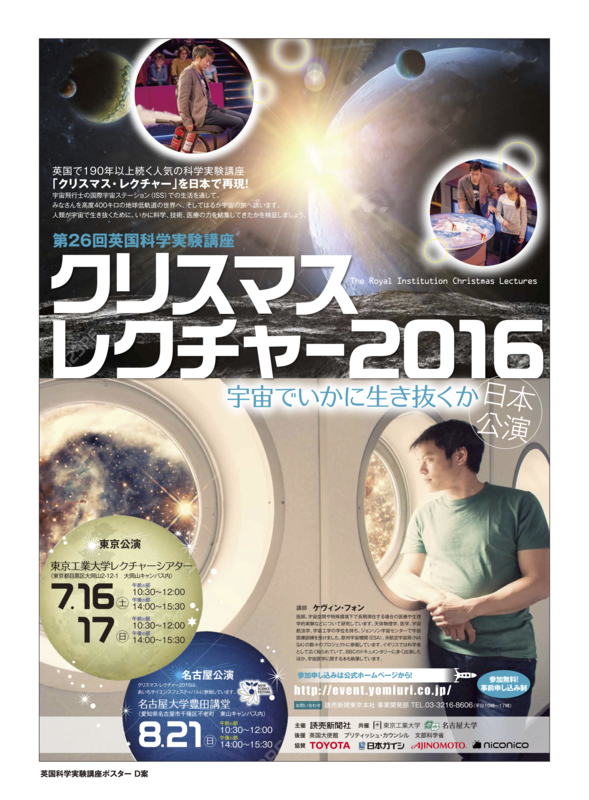 The popular science event known as “The Royal Institute Christmas Lectures” will be reproduced in Nagoya University. Leadership Development Seminor entitled “International Space Law: Outlooks for Future Cooperation” will be held. The Leadership Development Program for Space Exploration and Research program is looking for new 1st Grade of Doctoral Course (D1) Transfer Students for Fall Admission (D1-F). Leadership Development Seminor entitled “Who is qualified as a leader?” will be held. The Leadership Development Program for Space Exploration and Research program is looking for new1st Grade of Master (M1) & Doctoral Course (D1) International Students in Pre-admission Category (M1-P/D1-P). Leadership Development Seminor entitled “Decision-making architecture in Japanese space activity” will be held. This is an announcement of special lecture “Policy Making Challenges in Local Development” by Dr. Aser B Javier, Professor at the Institute of Governance and Rural Development, College of Public Affairs and Development, University of the Philippines Los Banos Visiting Professor at Graduate School of International Development, Nagoya University. We also organize the related event of movie showing “Coffee and Cigarettes”. Please see this link for the details and registration. We organize the LGS Women's Association for the Future Career on March 26 and 27. Female graduate students participating in all 62 Leading Graduate School Programs get together to share and talk about dreams, concerns and worries about future. The web page was renewed.